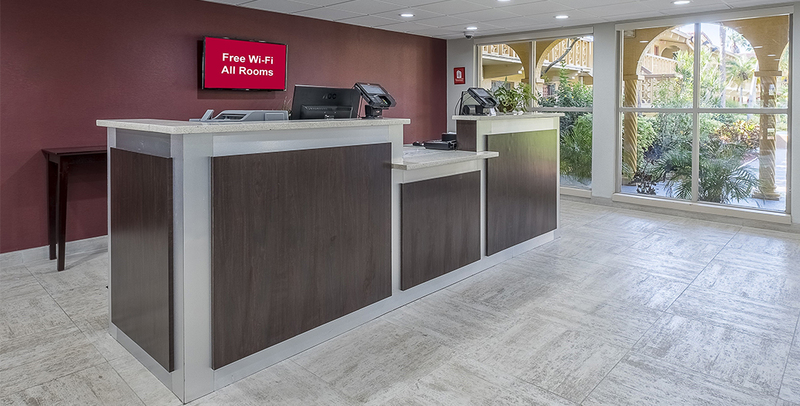 Our newly renovated Red Roof Inn was designed to be the perfect place for guests to gather before they head out and explore Tampa Bay. 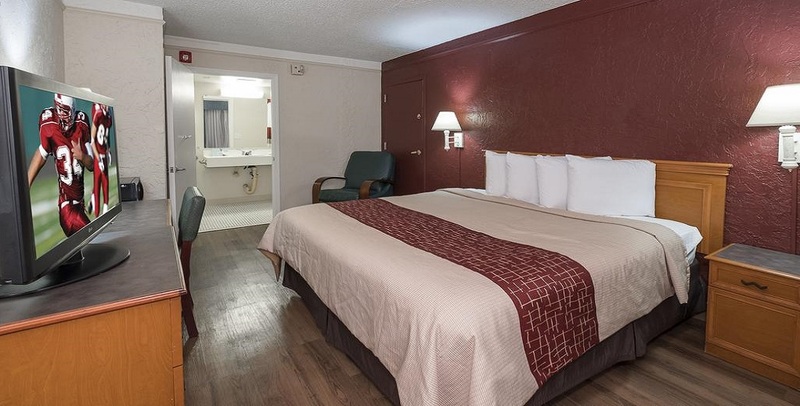 Book your stay today and enjoy one of our spacious and comfortable guest rooms with great amenities and professional service. 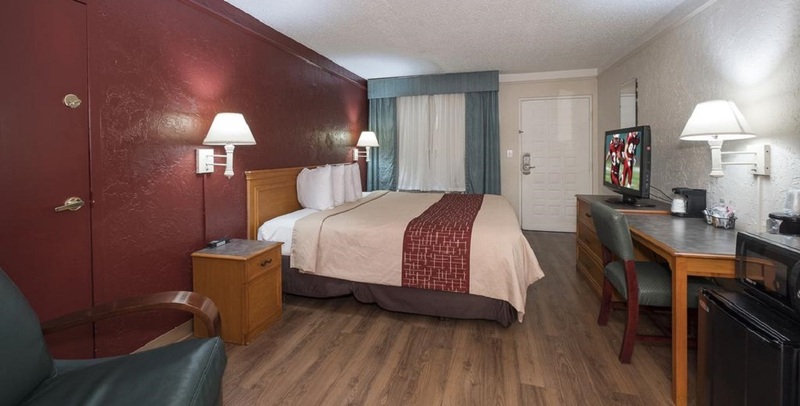 Red Roof Inn Tampa Bay – St Petersburg is a perfect location to live out your travel itinerary. 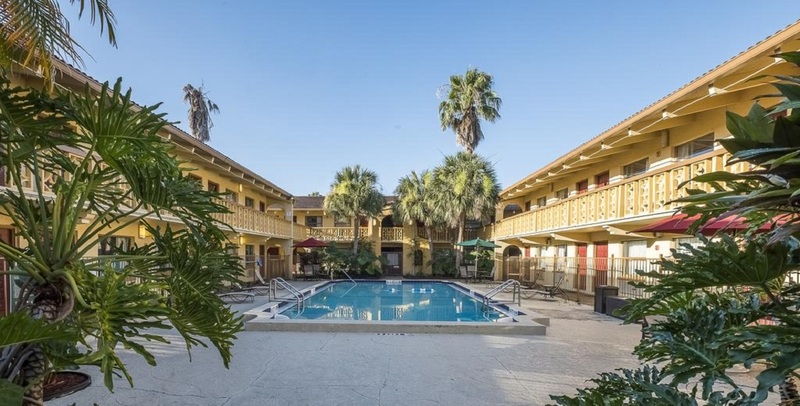 In close proximity to the hotel, you can find Fort Desoto Park and Baywalk Center. 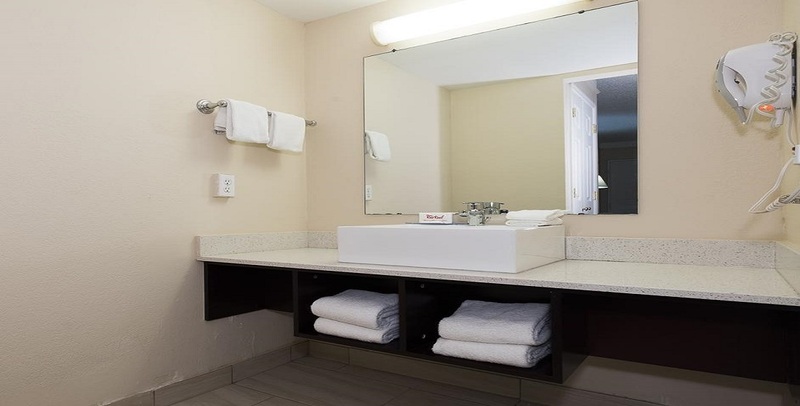 We want every one of our guests to feel at home when they stay with us which is why we offer convenient amenities and services like a business center, free parking, fitness facility, guest laundry, an outdoor pool and a meeting space. Complimentary coffee and tea are also offered in the lobby. Additionally, who could leave their furry friend behind? We are proudly pet-friendly, meaning that you can enjoy your vacation getaways to the fullest, without any guilt involved. 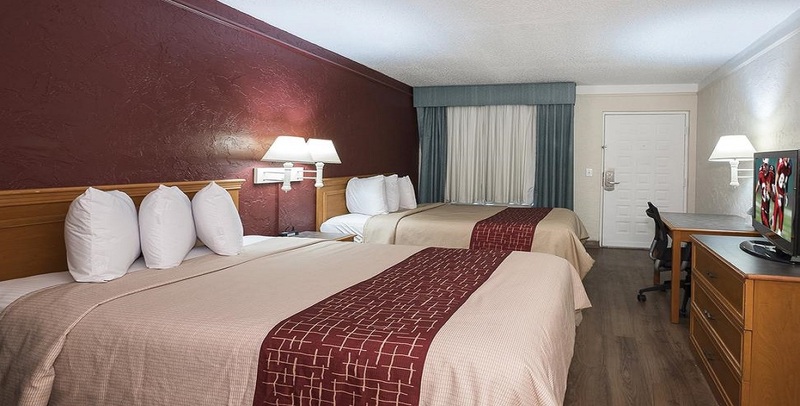 If you want to have the comfortable stay and good night's sleep after a long day, then our spacious rooms which feature world-class amenities will make it happen for you. 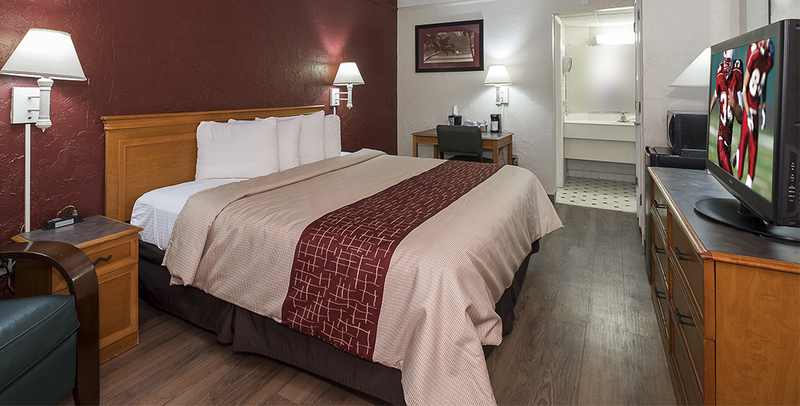 In-room amenities include Wifi, a flat screen TV and a triple-sheeted bed. 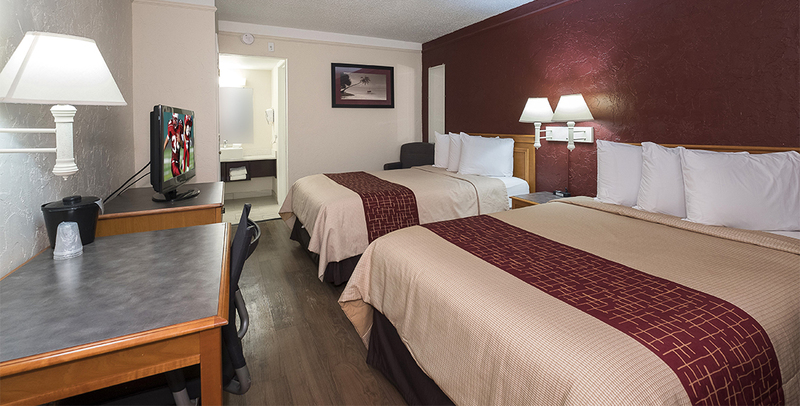 Here at Red Roof Inn, we have the passion and drive to make your stay a memorable experience. Tampa Bay's cuisine is just as unique and rich as our culture. Oishi Sushi & Japanese Steak House, Mi Carreta Restaurant and Bakery, ABC Seafood Restaurant, Doc's Haines Road Hot Dogs, Mekong Restaurant, Thuy Cafe, Taste of Gourmet, Ha Long Bay Restaurant, and Red Lobster are only a couple miles away from our Red Roof Inn. We want you to have a happy heart so eat well during your stay. Are you looking for places to put your credit cards through a good workout? Treasure awaits you in Tampa Bay. From upscale shops and malls to outdoor shopping and markets, you'll be in for a treat. International Plaza and Bay Street, WestShore Plaza, Hyde Park Village are not just a mall, it's a destination. Shop until you drop and smile through the process. The purpose of life is to have fun and be happy. Come for the beaches, toes in the sand and stay for the opportunity experience great weather year-round! 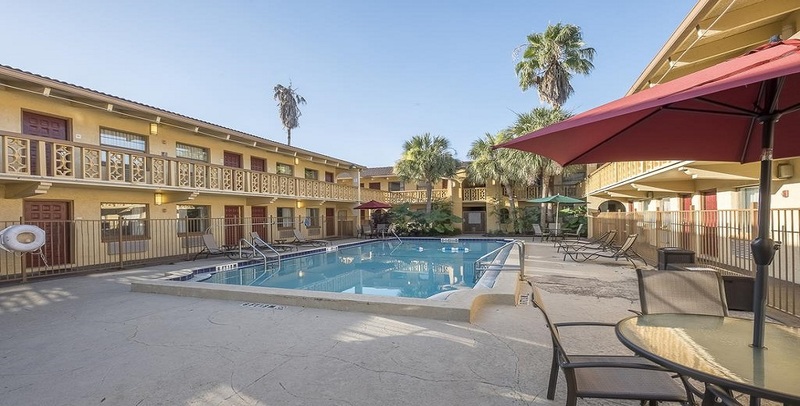 Tampa Bay offers an abundance of family activities, sprawling parks, and interesting neighborhoods. The whole family can feed pelicans at BayWalk Center and the St. Pete Pier, drift down a lazy river in a canoe, discover Florida's wilderness on a hiking trail, swim in warm waters, or explore Tampa Bay's bike trails. Do you come alive in the night? If you are looking to dress up, raise a glass and have fun, Tampa Bay is your city. Plan the perfect night out with a variety of options including Tampa's finest bars, casinos, and comedy clubs. 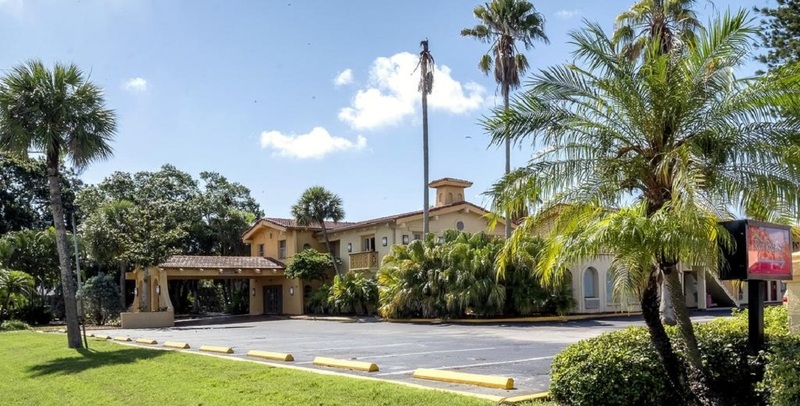 Hyde Park Cafe, Repeal 18, The Kennedy, Dubai Nightclub, The Castle, Club Plush, and Blur Nightclub are some of Tampa's most thriving nightlife locations. The night is young, come hang out and enjoy a time of conversation, community and drinks! Clam Bayou Nature Park Formerly known as Osgood Point.Clam Bayou Nature Park is located south of 29th Avenue South, on Miriam Street. 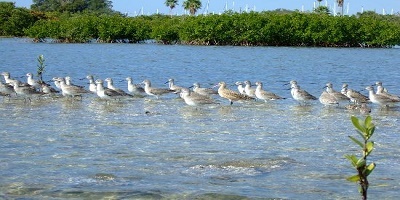 It plays an important role in the Clam Bayou Estuary of Boca Ciega Bay. This nature park/estuary provides several environments; from the upland natural vegetation, marsh and mangrove forests, to the deeper waters of Boca Ciega Bay. These areas provide habitat and food to a variety of species such as fiddler crabs, clams, wading birds, small animals, dolphins and manatees; to name a few. Some restoration projects for Clam Bayou have been completed in Gulfport and St. Petersburg and more are planned for the future. Come escape the urban crowds and enjoy a scenic stroll around the treasures of nature. South-southwest of St. Petersburg, Florida, Fort De Soto Park is a park operated by Pinellas County on five offshore keys, or islands: Madelaine Key, St. Jean Key, St. Christopher Key, Bonne Fortune Key and the main island, Mullet Key. The keys are connected by either bridge or causeway. The island group is accessible by toll road from the mainland. Historically, the islands were used for military fortifications; remnants and a museum exhibit this history. Two piers, beaches, picnic area, hiking trails, bicycling trails, kayak trail, and a ferry to Egmont Key State Park are available. 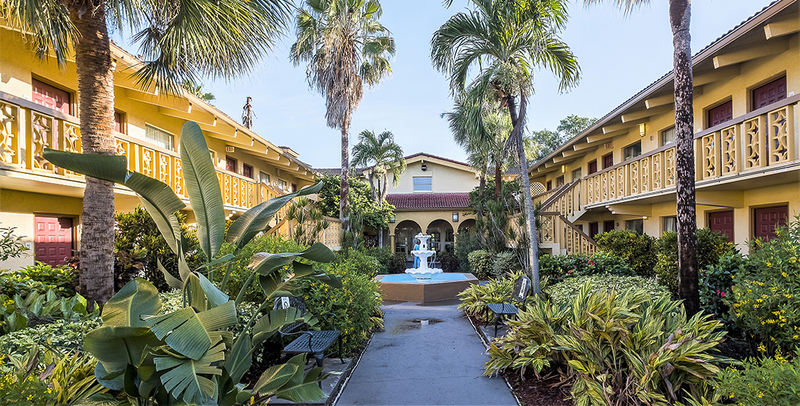 The Sunken Gardens are 4 acres of well-established botanical gardens, located in the Historic Old Northeast neighborhood of St. Petersburg, Florida, at 1825 4th Street North. 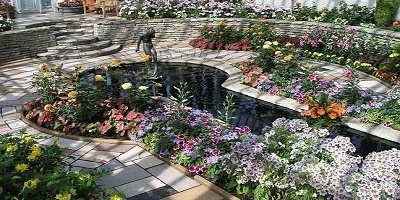 The Gardens have existed for more than a century, and are one of the oldest roadside tourist attractions in the United States. The Gardens are now operated by the City of St. Petersburg, FL and maintained with the help of volunteers. 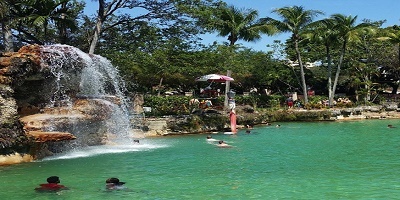 Sunken Gardens are open to the public every day of the week. An admission fee is charged for entrance into the gardens and a yearly membership is also available. 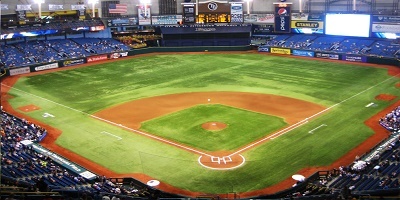 Tropicana Field, also commonly known as The Trop, is a domed stadium in St. Petersburg, Florida, United States, that has been the home of the Tampa Bay Rays of Major League Baseball (MLB) since the team's inaugural season in 1998. The stadium is also used for college football, and since December 2008 has been the home of the St. Petersburg Bowl, an annual postseason bowl game. It is currently the only non-retractable domed stadium in Major League Baseball, and is the smallest MLB stadium by seating capacity when obstructed-view rows in the uppermost sections are covered with tarp as they are for most Rays games. All children are welcome. Free! Up to two children under 18 years stay free of charge when using existing beds. Any additional older children or adults are charged USD 6 per person per night when using existing beds. Free! One older child or adult stays free of charge in an extra bed. Free! One child under 4 years stays free of charge in a crib. The maximum number of extra beds/cribs in a room is 1. Any type of extra bed or crib is upon request and needs to be confirmed by management. Additional fees are not calculated automatically in the total cost and will have to be paid for separately during your stay. 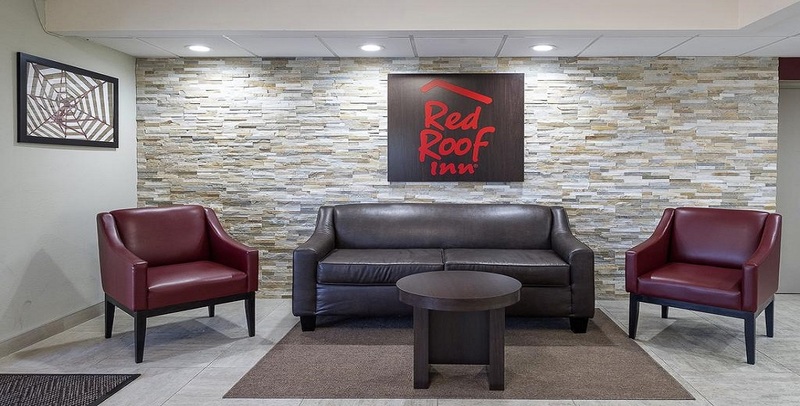 I had a wonderful stay at this red roof inn. 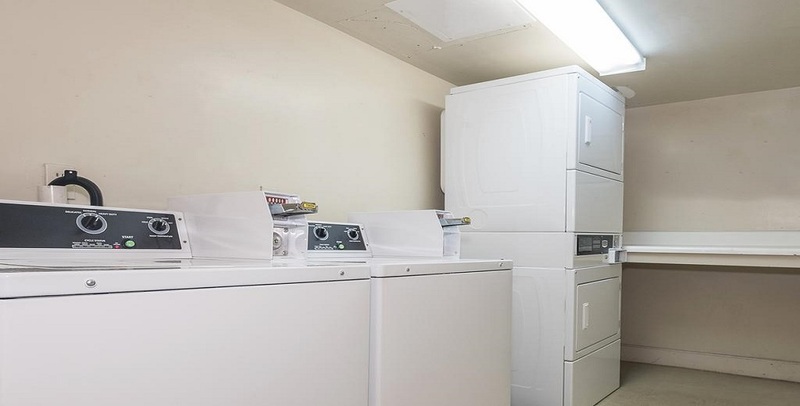 The staff was respectful and inviting and did a great job maintaining cleanliness and customer requests. I would personally stay here again because it felt like a lagerious experiance with a pool! The room was very pleasant and relaxing. The pool was nice, the people staying at the hotel we're very nice and respectful. No druggies running around asking you for money or anything like that. Just a very relaxing atmosphere. The lady who checked us in was really nice and offered her help with our luggage, her name was Earneisha (hope I'm spelling that right) and she really deserves a raise for all the things she does. I had an amazing stay and the front desk personal at night Holly Belhumeur was above and beyond helpful!!! 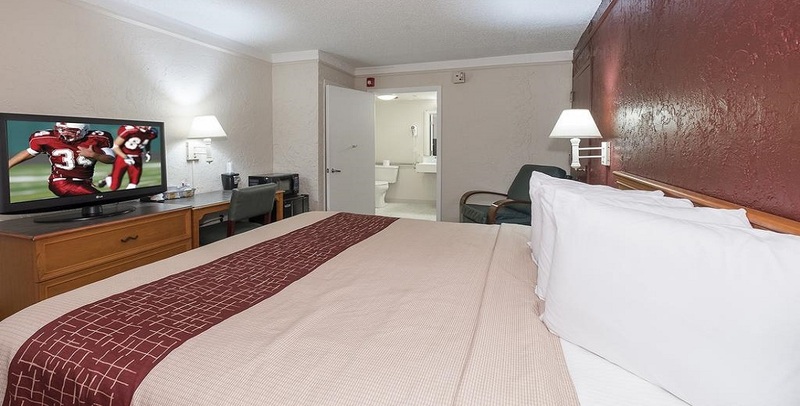 I was in room 110 and I had a great stay , the pool was wonderful and it was convenient to everything. I felt welcomed as soon as I walked through the door. The room was super clean and very upgraded. Also Kia was amazing at the front desk and I will be back because of her. Anything I needed plus a super easy check in process. Thanks again Kia! Loved this Hotel. Had excellent service the night we checked in, the lady (not sure what her name is) that night was very helpful and the same the next day as Dawn got us checked out. The room was clean, very comfortable and it had all that was needed for our stay, including enough plugins for all of our electronics. Dawn is an awesome lady, who made sure she also kept an eye on our 2 motorcycles all night. The rooms have just been beautifully renovated. Dawn the manager is absolutely amazing, she along with her staff go above and beyond for each guest. Their weekly rates are the lowest we have found and the quality by far surpasses all the others that claim to be the cheapest. I highly recommend the Red Roof and don't forget they are pet friendly!! One of the best hotels for the price the staff is extremely helpful and the GM Dawn is amazing! We probably called Kia several times at the front desk for help and she did an amazing job! Would recommend!!! Room was nice and clean. Room very easy to access. Maid service is excellent. I really like the Samsung television in my room. Watching television was a new experience. Multiple channels. The front desk provides free bottle water, coffee, and soft drinks. I would stay there again. Property is also next door to a Denny's. I had a wonderful experience staying at this hotel. Very helpful staff, especially the night manager Holly Belhumeur. She was professional and courteous while giving exceptional customer service. The room was very clean and quiet, despite being fully booked. I will definitely return.